SNES Super Metroid (JPN/USA) "game end glitch" in 12:54.71 by cpadolf. 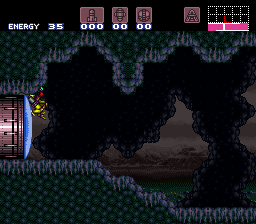 With the use of the X-Ray Scope to get out of the rooms' bounds and gratuitous amounts of RAM rewriting, the amount of tasks Samus usually has on Zebes has been cut to almost nothing. No boss is ever fought in this TAS, and even Mother Brain is skipped completely. The in-game completion time is 00:06, and only 6% of the items are collected, making this the lowest legitimate percent completion ever achieved. This is an improvement of 1:58.36 minutes real-time over the previous runs of this category.